Roll up and listen. Now that we have gone over boards and trucks, the final part to completely understanding longboards is the wheels! Wheels can be large or small, soft or hard, with a core or not, with square edges or rounded ones. They come in every color of the rainbow. So let’s get rolling to find out what longboard wheel is right for you, sharing the key points without wearing you out (or down to core) with useless info. 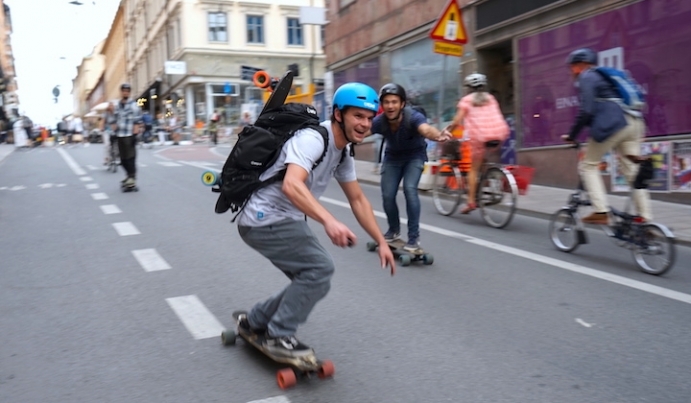 The size of skateboard and longboard wheels around the world is their diameter in millimeters (mm). Compared to small shortboard skate wheels (under 60 mm), longboard wheels are massive, reaching up to over 100 mm! The larger the wheel, the faster they roll and the slower they accelerate. The smaller they are, the faster the acceleration and slower overall speed. Big soft wheels will help you take charge of the streets, saving you from sudden surprises by absorbing impacts from stones and cracks in the road and gripping strongly as you catch fast turns. Still, you are going to have to do some extra pushing or find a good hill to get up to speed! In general, hardness is measured by the Durometer A Scale, a 100-point scale with 100A being the hardest. (A "101A" wheel means that it's harder than what the A scale measures.) Hard wheels roll fast, but have a hard-to-predict slip. Soft wheels are grippy, absorb vibrations, and are slower and harder to slide, but they have a more controlable drift. Longboard wheels hardness tend to be 70A-80A while shortboard wheels are usually 90A-101A. A soft but durable middle 70A will do you for crusing, but once you start to understand what you really like to skate, you can try to go harder or softer. The width of the wheel affects grip and traction. The contact patch is the actual flat part of the wheel that makes sweet love to the road, varying from 30 mm to 70 mm. The larger that is, the more grip it gives. Narrower wheels will let you slide and drift better. It all depends what kind of contact you you want at what speeds you are riding. Square edges will give you a larger contact patch and make it harder to initiate drifts. Bevelled edges (45 degrees) are usually found on short board wheels. Rounded edges mean a more progressive curved edge than bevels, although the reduced contact patch will make the wheel slide easier than a beveled one. A plastic core adds comfort to your cruise and maintains more regular wearing. Most longboard wheels use cores to help dissipate heat caused by friction coming off bearings at high speeds. A core will let you go fast when on smooth roads, but has the opposite affect on rougher surfaces. The position of the core can affect the ride of the wheel as well. A perfectly centered core makes for even wear, allowing them to be easily flipped, while offset cores are closer to a single side of the wheel. Offsets are more subject to irregular wear called "coning" but let you more easily initiate a power slide. With electric skateboards you usually want to establish a tight bond between the wheel and the road so, from what we just learned, what does that mean? You want larger, soft but durable wheels with a nice centered core. Keep in mind the conditions of the roads you roll on. Since acceleration is provided by the motor, pushability of the wheels is not much of a worry. Some brands will let you put just about any kind of wheel on your e-skate while others require you to use proprietary ones, especially with hub motors. Mellow's unique anti-slip Drive Wheel system is an innovative feature that requires our own custom wheels. The right wheels for a Mellow Board set up would be the standard 80mm 86a. Other sizea, hard/softness and styles will eventually be available. For your front truck you have more freedom of choice today already. Although slightly larger or smaller wheels will work, they should match the drive wheels in size and hardness for a more accurate ride. Try to find similar specs (80mm 86a) or else go grab a pair of official Mellow Wheels to show your colors! Stay tuned to our Mellow Times newsletter for our next Understanding Longboards where we get rolling into what is the difference with all the wheels out there.